If you are fond of taking still life pictures, you may always want to get the best lighting to get the best images. Even amateur photographers know that this is not always possible under normal conditions. Taking pictures in the best light may require better lighting. An affordable even for amateur photographers would be this portable Tabletop Photo Studio. This Tabletop Photo Studio is ideal for taking pictures of small items like jewelry and other collectibles that can be used for online auction sites or to serve as records. It can also be used by avid photographers interested in getting still life images under the best light. The Tabletop Photo Studio features a compact light box with an integrated diffuser screen, two backdrops and two high output lights that come with retractable and adjustable legs. When not in use, the portable backdrop folds flat for easy storage. 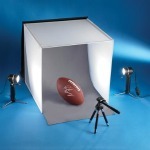 The Tabletop Photo Studio is available at SkyMall for US$100.